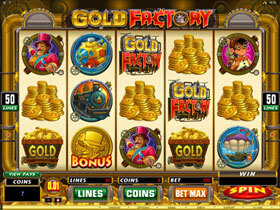 Gold Factory – 50 Payline, 5 Reel video slot with a shimmering gold theme. The game enters a mysterious gold factory where tons of gold is produced. Observe the gold falling down a chute, wishing some of it could be yours! Animations include gold bars, gold coins, gold cart, submarines, hot air balloons, and trains. Players can bet up to 20 coins per payline, which leads up to a maximum bet of 1 000 coins. In the Boiler Room the gold is discharged from 12 hoppers onto a mini train. Choose 4 hoppers to reveal the hidden prizes. When finding the Free Spins and Reactor Bonus symbol, you move up to the 2nd level of bonuses. Get the Free Spins symbol during the Boiler Room bonus, between 10 and 35 free spins will be awarded. This bonus is triggered when landing the Reactor Bonus logos within the Boiler Room Bonus. Choose from 4 Boilers to get either instant coin credits, free spins or the 2nd part of the Reactor Bonus. 12 items will be shown; players pick items until a malfunction button appears, and the round ends. The Wild Symbol substitutes for all symbols other than the Scatter symbol. All wins pay from left to right except the scatter which can appear anywhere. 3 or more Scatter symbols will open the Gold Factory Bonus Game. The Bonus Game will be activated by 3 or more Scatters showing up anywhere on the reels, and Pays up to 619,000 coins. The base game is played in the Boiler Room. Acquire your wealth by loading as many gold nuggets as you can into your mining cart. The music has a fairy-tale effect, but the gold winnings are certainly for real! !